The laboratory robotics is the practice of using the robots to perform or assist in the laboratory tasks, While the laboratory robots have found the applications in diverse industries and sciences, and the pharmaceutical companies have used them more than any other group. The laboratory robotics is the act of using robots in the biology or the chemistry labs, The pharmaceutical companies employ the robots to move the chemical or the biological samples to synthesize the novel chemical entities or to test the pharmaceutical value of existing chemical matter. The laboratory processes are suited for the robotic automation as the processes are composed of the repetitive movements, The robots can pick/place the liquid & the solid additions, they can heat/cool, mix, shake & test, Many laboratory robots are referred as the auto-samplers as their main task is to provide continuous samples for the analytical devices. 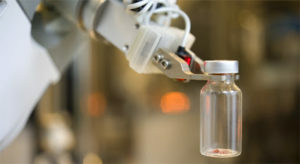 One of the most rapidly growing areas in the laboratory automation is the use of the robotics for the sample preparation as the manual preparation of samples has remained a time-consuming problem, The advanced laboratory robotics can be used to completely automate the process of science, as in Robot Scientist project. What does the robot have in common with a technician? The laboratory robot has an arm, hand, and fingers, These components are programmed to repeat the sample preparation that performed by the laboratory technician, The robots’ arm moves up/down , in/out , and rotates 360°, The laboratory hand can hold the test tube, The fingers grip the tubes and the flasks , and the hand rotates for pouring the liquids. The centrally positioned robot moves the samples in and out of the laboratory work stations, Each work station performs a specific function, The laboratory robot can dispense the acids, mix, heat, centrifuge, filter, and weigh, These robots can be programmed to perform many different tasks such as the sample preparation and handling. Laboratory robotics offer high speed, high efficiency, minimal wastage, task reproducibility, They present task endurance, precision, high productivity, and the enhanced safety for the laboratory personnel. Laboratory robotics offer the ability to withstand the adverse environmental conditions, and they reduce tedium and boredom among the laboratory workers who would otherwise perform the tasks. The laboratory robots have improved the productivity by a factor of 2 or 3, Because the sample preparation requires the use of hazardous chemicals, The robots minimize the human exposure to these chemicals, By delegating the repetitive applications to the robots, They provide consistency in sample preparation and they improve the precision of the data. One of the advantages to the automation is faster processing, but it is not necessarily faster than the human operator, The repeatability and the reproducibility are improved as the automated systems as less likely to have the variances in the reagent quantities and less likely to have the variances in the reaction conditions. The productivity is increased since the human constraints such as the time constraints are no longer the factor, The efficiency is improved as the robots can work continuously and they can reduce the amount of reagents that used to perform the reaction. The laboratory robots reduce the material waste, The automation can establish safer working environments since the hazardous compounds do not have to be handled, The automation allows the staff to focus on the other tasks which are not repetitive. The laboratory robotics have some shortcomings and limitations like high initial cost, limited flexibility, and they have lack of intuition for solving difficult or esoteric problems, layoffs of the human workers (as the robots replace them) can damage the employee morale. The laboratory robotics are very expensive to set up and start up, The price of single synthesis is high or the sample assessment cost is very expensive, The cost for the automation can be expensive as a lot of techniques have not been developed for the automation yet. There is difficultly automating instances where the visual analysis, the recognition or the comparison is required such as the color changes, This also leads to the analysis being limited by the available sensory inputs. One potential disadvantage is the increases job shortages as the automation may replace the staff members who do the tasks easily replicated by the robot, Some systems require the use of the programming languages such as using C++ or using Visual Basic to run more complicated tasks.